I’m happy when I get the question; it gives me the opportunity to talk it through. Too many times, people assume or jump to the conclusion that the role of project manager must be the Scrum Master in the Scrum framework. Maybe it’s because they kind of know what a Product Owner does. The role has the word “product” in it anyway and we know what the product is—sort of. And everyone knows what a “developer” is—or at least they think they do. But what is this crazy term: Scrum Master? They know they have “project managers” and Scrum Master is new and unfamiliar so, obviously, the Scrum Master is a project manager, right? For whatever reasons people believe the Scrum Master to be a project manager, they couldn’t be much further from the truth. Most Scrum-knowledgeable people would also say the Scrum Master “removes impediments.” Which is true although she may do so by coaching the Development Team or Product Owner on how they could remove the impediment themselves. If we’re able to move forward again, we’ve adhered to the intent of the Scrum framework. Contrast this description with the role of project manager. To do that, I often ask groups to list the activities of a project manager. After learning about the roles in the Scrum framework, we then go through those activities and decide which role in Scrum might be responsible for that activity, based on the definition of Scrum. 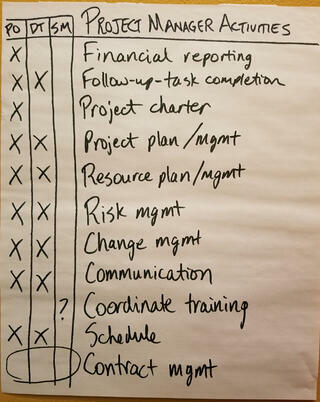 (By the way, “mgmt” means “management.”) Of course, your list of project manager activities may differ. I’ve found each organization has their own. In this image, PO stands for Product Owner, DT for Development Team, and SM for Scrum Master. Notice the Scrum Master has little, if anything, to do with traditional project manager activities! Nevertheless, at least 80% of the activities people typically identify as “project manager stuff” are performed (although sometimes differently) by one or more roles in Scrum. So, what about the other 20%? Maybe you need a project manager for that. I don’t know. Sometimes, those activities are specific to waterfall development and may no longer be needed. Or maybe they’re needed for now but may be modified or eliminated as the organization matures in its use of Scrum. So back to the original questions: “I’m a project manager. What do I do?” The answer is: How can you best contribute to the goals of the organizations. Groups don’t (or at least, shouldn’t) adopt Scrum for Scrum’s-sake. People adopt Scrum to improve business agility—their ability to quickly and effectively respond to changes in their environment. So how can you contribute to that? That’s when the discussion gets interesting.